People tend to believe new printing machinery comes with better results. They’re wrong. Typically, it’s not the equipment, but the knowledge of the user that makes the difference. We may live in a digital era; it would be nothing without the craftsmanship and creativity of designers and manufacturers. This certainly applies to inkjet textile printing. Sure, inkjet has turned the textile industry upside down, creating numerous of possibilities for personalisation and design. But to get to brilliant colour shades and out-of-this-world ink fixation, you need a little more than that. Here’s why… and how. First, let’s find out why inkjet textile printing has become so popular. As opposed to traditional printing methods, digital printing is not bound by screen size. This means that textile manufacturers have all the freedom in the world to print to order, no matter the product format or order size. Additionally, as the ink is added to the fabric on the spot instead of through roles or screens, digital printers can be set in motion in no time, providing you with all the colours you need for your many different designs. Such flexibility is worth a lot, especially in high fashion where customers spend a lot of money on their clothes and sportswear. But also for more standard collections, inkjet printing speeds up time to market, which makes it the perfect way to live up to customer expectations. But hold your horses. No matter how innovative, digital textile printers can’t work wonders all by themselves. It’s not a matter of pressing the print button and waiting for the perfect vest, swimsuit, or silk scarf to come out. If you want excellent colour sharpness, great ink penetration, lovely fabric handle, and amazing shade depth (and you probably want to), you need to step up your game. Or in proper English: you need a chemical preparation step that makes it happen for you. A thickener, for example, will keep the ink from bleeding or migrating, whereas fixation accelerators make sure the ink sticks to the fabric. Others improve the feel and shade depth of the end product, or protect the ink against external influences. And these are only examples. We can imagine you’re half way out the door to do some chemical shopping. There’s nothing wrong with that, but before you do, make sure you finish this article. If you want to improve your inkjet printing results, you can’t go around doing some research first. Fabric types such as cotton, polyester, and polyamide all have their own features and treating methods, meaning they’ll be needing specific chemical combinations. Furthermore, as you probably work on several product types (clothes, sportswear, and maybe bed linen, flags, curtains), you need to adapt your chemical cocktail to your different production processes. The solution lies in carefully testing different ingredients on your products, until you’ve reached the ultimate end result. Whether you do this on premise or in a lab that’s specially designed for inkjet printing testing: work on a solution that matches your specific fabrics! TANATEX Chemicals recently introduced TANA®JET: a wide range of products that improve inkjet printing results. Together, these products form a Digital Printing Concept that helps you get the best out of your printed fabrics. Thanks to thorough research in and outside our digital printing lab, we know which chemicals to add, at what time, and onto which fabric type. As each textile manufacturer works according to his own preferences, our specialists offer technical support to get to the perfect end result. We could not be more proud, but as our specialists are terrible in showing off, we figured we rather proof our expertise than bombarding you with marketing slogans and press releases. This is why we wrote a white paper to help you get started. And if you were to need any help, you will know where to find us! 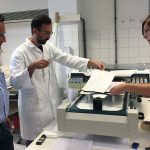 This article was written by Tanatex, a group of enthusiastic science lovers with a passion for textiles and everything that makes them better. This is why we created TANAJET: a wide range of products that improve inkjet printing results in the broadest sense of the word. Our not-so-secret weapons include our digital printing lab, our specialists, and our many years of experience. Feel free to contact us for more information!